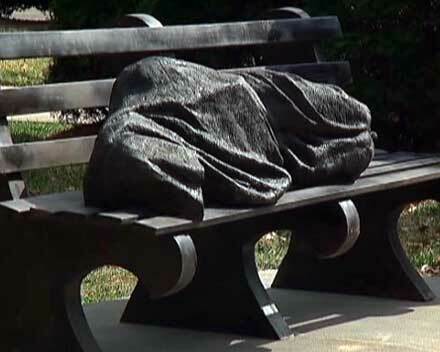 The pictured bronze sculpture of the homeless Jesus, by renowned Canadian Catholic artist Timothy P. Schmalz, has proved challenging and controversial. It should not be difficult to imagine Jesus as homeless. He pointed out to a would-be disciple that foxes have holes, birds have nests, but the Son of Man has nowhere to lay his head. In Matthew 25 he identifies with the hungry, naked, sick or Imprisoned, with all the needy of this world. 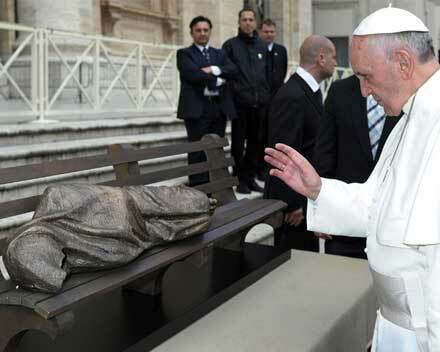 But the unveiling of this stark figure of the homeless Jesus asleep on a park bench, shrouded in a blanket, identified only by the visible wounds in his feet, triggered ambivalent reactions in religious people. Some Cathedrals considered it inappropriate for their setting. A well-washed and affluent parishioner protested that she wanted a Jesus who would meet her needs, not someone who was needy. Another observer” thought there was something poignant about the fact that there was a space for one to sit on the bench with Jesus. I really liked that.” When it was placed in St Peter’s Square in Rome, Pope Francis interrupted his drive to look at the sculpture, touch it, pray over it, bless it and find a place for it in the Vatican, to the profound emotion of Schmaltz. Now the Irish Jesuit Provincial has received a gift of this sculpture, and raises the question: where can it be best installed? Clearly it needs to be in a place where it is seen by plenty of people. There is a committee in the Jesuit Curia which is canvassing for proposals from any work which would be interested in having this sculpture.